Make the brownie batter and add espresso. While the Epicurious recipe was used, you may make this brownie using any batter you like. Cut portions of cheesecake into cubes. In a 13X9X2 inch pan lined with parchment paper, pour 1/4 to 1/2 half of brownie batter and make a layer. Place cubed cheesecakes uniformly over layer. Pour remaining of brownie batter. Bake in oven at 350 deg F for 30-35 minutes, remove, and let cool. In a double boiler (i.e. Farberware Classic 2 Qt Double Boiler), melt the dark callebaut chocolate and pour on top as the frosting. For swirls, melt the white callebaut chocolate pouring them on top of the dark chocolate and draw squiggly patterns using a toothpick. 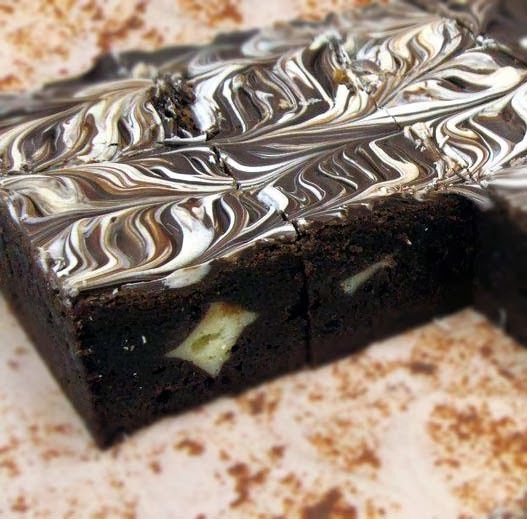 See this other brownie recipe with cheesecake.